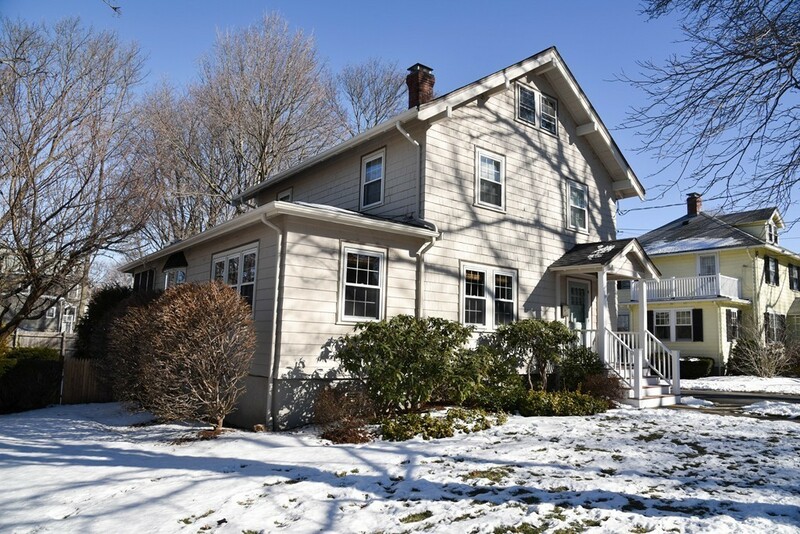 Enjoy idyllic neighborhood living in this inviting Horace Mann area Colonial with updates galore (see listing sheet) and walkable to everything. This welcoming home exudes an attractive warmth & scale and boasts beautiful craftsmanship so it's easy to picture yourself appreciating gatherings with family & friends, cozy evenings at home and supper on the screen porch. Spacious, light-filled LR, hosting a wood-burning fireplace with fluted mantle & window seat surrounded by built-ins, opens to the DR, featuring a built-in china cabinet, which centers the den and kit. Updated eat-in kitchen boasts granite, stainless appliances, farmer's sink & custom cabinetry. Gleaming hardwood floors, crown molding throughout the 1st. Three generous BRs, full bath and office, used as a closet, which opens to the attic storage (expansion possibilities). Awesome screen porch overlooks the flat, landscaped yard. Garage. Fab locale nr playground, schools, train, Whole Foods & more. Come make this "home"!